John Joseph Adams, editor of the sister professional electronic magazines Lightspeed (debut 2010 as an e-zine) and Fantasy (debut 2005 as a print magazine, then e-zine in 2007), will take the reins as publisher of the magazines with their January 2012 issues. In his December 2011 Lightspeed editorial, Adams relates the circumstances of his purchase of the magazines from current publisher Sean Wallace, also publisher of Prime Books. The bigger news, however, is Adams' announcement that in January 2012 both monthly magazines will merge under the Lightspeed title. Fiction content will be equally divided between SF and Fantasy, with an equal number of reprints (as has been the current policy) from both genres. Further details concerning the merger and other format changes are outlined in Adams' editorial. 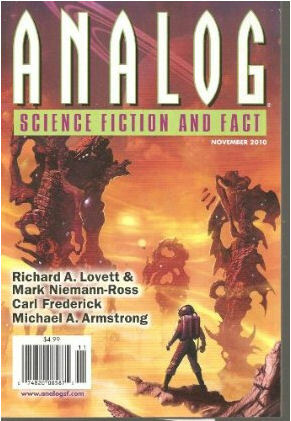 Adams expands on his editorial for Tangent Online explaining that "The schedule will be somewhat flexible; there will always be one SF and one Fantasy story, but it won't always be original/original or reprint/reprint any given week. It might be original/reprint one week, original/original the next week, reprint/reprint another week, etc." He further clarified by saying that there will "always be 4 originals and 4 reprints in each issue. 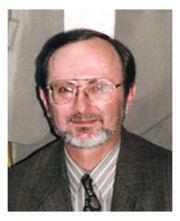 The only flexibility will be in when the reprints publish during the month." 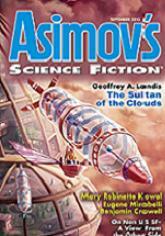 The 2011 Theodore Sturgeon Award for Best Short Fiction of the Year was awarded July 8, 2011 to Geoffrey A. Landis for his story “The Sultan of the Clouds”(Asimov’s, 9/10). The award was presented following the combined Campbell/Sturgeon Awards banquet held at the University of Kansas-Lawrence, Kansas. We congratulate Geoffrey A. Landis for his rousing, good old-fashioned SF story and award, as well as the other nominees, listed below. This year's Sturgeon finalists were posted Thursday, June 9, 2011. The eleven finalists are listed below in alphabetical order by author. 2011 Nebula Awards -- Washington, D. C.
The 2011 Nebula Awards banquet was held Saturday, May 21, 2011 in Washington, D.C. Presented by the Science Fiction and Fantasy Writers of America (SFWA) annually, the winners are as follows. While we congratulate all of this year's recipients, we are especially proud of Eric James Stone for his win in the novelette category, for Eric hosts and maintains the Tangent Online website. Heartfelt congratulations, Eric! I am still receiving review copies forwarded from my old address, so if you wish to send anything for possible review please email so I can provide my new address. It's great to be back and we hope to be caught up and rolling again very shortly. I appreciate your patience in my absence. If my count is correct, there are almost 190 short stories, novellas and novelettes in the following list, not including those in Dave's afterword. In spite of the fact that Tangent Online comprises more than a dozen regular reviewers and a number of occasional ones, that's a pretty impressive reading list. And these are only the ones we recommend—for every story you see on this list, there are at least four others that didn’t make the cut. This is up from 170-plus in last year’s list. We always get the urge to type this around the middle of this month. Blame Shakespeare. Or if you’re tired of blaming old Will, take a cue from South Park. This year, the Ides of March bring us the fourth installment of Robert Weinberg’s Collecting Fantasy Art series; this one is titled “Art Mania!” We’re very happy to be hosting this series, as it is an important memoir in the history of the art of science fiction and fantasy. Many people have written books about science fiction and fantasy art, but to our knowledge, this is the first (maybe to be a book in the near future) written about the “collecting bug” by one of the premier art collectors in our field. We hope you are enjoying not only this important series, but also our regular series of short fiction reviews. Our reviewing staff are kept, we believe, very happy in their perfumed cages with the gilded bars; they rest on plump pillows of pure velvet, while a bevy of beautiful robotic servants (who are here, after all, to Serve Mankind) feeds them peeled grapes and luscious chocolates, not to mention the inevitable honeydew and Milk of Paradise, all the while murmuring soft words of encouragement into our reviewers’ shell-like ears. As always, we encourage you to visit our Facebook page and use the “Like” button; and we urge you to recommend us to your friends, who will thank you for it. After nearly seventeen years with the same basic format Tangent Online has now added several new features. The first of the new sections we've titled Classic SF/F. In this section we hope to bring to light outright classics of science fiction and fantasy of which newer readers and writers may not be aware—and sorely need to be, in our estimation—or those works of enduring popularity not necessarily regarded as “classics” in the traditional sense of the word. The following list is comprised of some 170-plus stories. Each length category (short story, novelette, novella) is separated into three further categories featuring stories that made an ever increasing impression on our reviewers. Thus, in each category, you will see a number of stories making the basic list, then a category of additional stories with one star (*), then two stars (**), and finally three stars (***), the latter being those with which the reviewers were most impressed. Welcome to the relaunch of Tangent Online. It's been quite awhile, hasn't it? But we're finally back, with a somewhat different look, new software fueling the enterprise, and a brand new web-hoster, Analog author Eric James Stone (whose newest story, "Attitude Adjustment," can be found in the September, 2009 issue). Eric is the person most responsible for Tangent Online even existing today. He stepped forward and offered to host the site, provided the new software, and has been more than patient with yours truly as I have learned how to use it (and which I am still learning the finer points of). Eric deserves your unqualified thanks for his selfless efforts in getting us up and running once more.